You should use your self-transformative-leadership oriented by self-endurance to sustain your personal change journey. This is how you achieve sustainable personal change. Your self-endurance is the portal through which your relevant personal qualities travel from your inside to your outside. Your self-transformative-leadership provides the power through your self-endurance portal to pull your personal qualities from your spirit dimension to your mind, your soul. Your self-transformative power is your active consciousness to exercise that selected combination of personal qualities in the specific situation you find yourself in. Is it that easy to exercise your selected personal qualities in a given situation? Your answer is, to the extent that you have been practicing to respond in situations. If it was easy you would not be bothering yourself taking out your precious time to read this. This means you need to practice your response abilities inside situations. If you stop practicing you know what will happen. You will retrogress. So to keep on progressing you should continuously practice. Living inside self-endurance is like eating food. You need the food to eat it. If there is no food you still need food. So you continue looking for food because you need to eat something. You have no choice, except to choose what to eat. But you cannot say, I ate yesterday so I will not eat today. Endurance is establishing your place inside patience and staying at that place for as long as life orders you to stay there. In order for you to stay inside endurance, "a cumulative sequence of patiences", you need transformative power, which resides in your transformative leadership style to keep you going, occasionally dispensing to you the transform qualities and quantities you need. 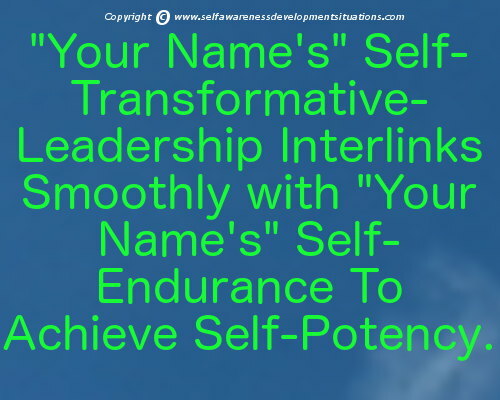 Of course you have your-purpose, your-goals, your-motives, your-hope and all those directional qualities to help maintain your line site going forward so that you have reason to walk inside your self-transformative-leadership. In the course of your walk the dynamic interactions between all your qualities yields the personal or shared group results you are pursuing. Make This Your Number Two Priority! Though speaking or talking or singing or instructing yourself, in and of its self, is not both sufficient and enough to get you where you need to operate from as a tripartite being, it is a very necessary and important thing for you to train yourself in. In this course I show you how to teach yourself to speak precisely, especially where your words need to procure life! SBI is a well integrated set of Tools, Processes and Teams You Will find In One Place Online.